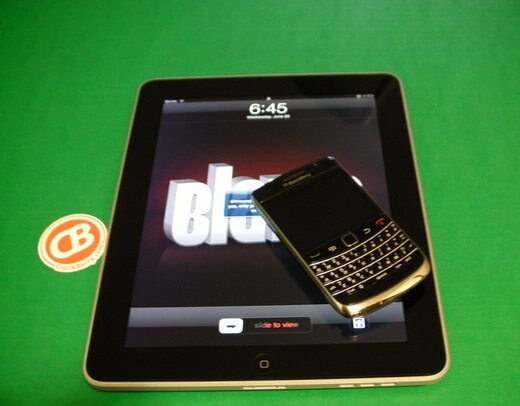 Love it or hate it, the iPad has made waves across the world and judging by the amount of people in the CrackBerry forums that have one, it's safe to say we better start acknowledging some of the stuff out there that is BlackBerry / iPad compatible. Which when you really think about it is quite a bit to cover, really. Everything from making use of accessories that work with iPad and BlackBerry right down to sending documents from your BlackBerry to your iPad. We'll be sure not to go too iPad overboard here on CrackBerry but one interesting thing that popped up in the forums was a method where you can actually tether your BlackBerry to your WiFi-enabled iPad if it's been jail broke. Now, to say this is a perfectly working solution would be a lie. I personally never got it to work for any great amount of time but many others in the forums have done so with great success. The process requires you to download a cydia app called iBluever and a BlackBerry application called PDANet. After a few setting adjustments you technically should be up and running using your BlackBerry data plan with your WiFi enabled iPad. That said, you should keep in mind that anytime something is interacting with your carrier data, you could incur extra charges. if you decide to set this up, you do so at your own risk. Thanks to aohus for posting this up for us.